Regular readers of this blog may have noticed that I’ve been talking more and more about the ZMOT. As research continues to demonstrate that your customers and prospects are taking on more and more of the buying process without your presence, the need to find new ways to connect and influence has become imperative. The Zero Moment of Truth refers to the point in the buying cycle when the customer/prospect researches a product/service, which often occurs before the seller even knows that the opportunity exists. The number of prospects researching a product online prior to purchase has been on the rise in recent years as the Internet and mobile continue to advance. When I share my insights into winning this new territory, I find myself fighting to not use the term “new,” when describing the approach. The truth is that the approaches for winning the moment aren’t new, they’re just ignored by the vast majority of small and mid-size (SMB) B2B organizations. Frankly while these techniques have always been valuable in driving predictable, sustainable and scalable growth, SMBs were able to survive, and even thrive, without paying attention to them. There was enough business out there that they could wait for opportunities to find them. They could focus on sales training and consultative selling to win the business when it presented itself. In the age of ZMOT consultative selling is losing a lot of its effectiveness because the seller is entering the conversation too late. Here’s the good news: winning the moment is there for the taking for any SMB willing to play by, and excel with the new rules. 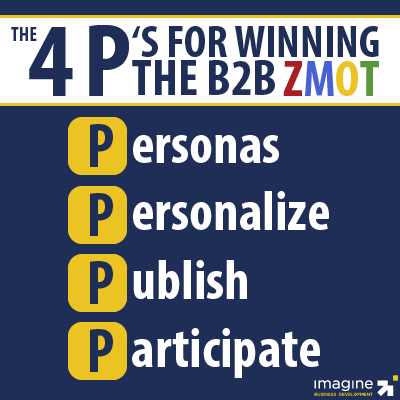 To win, you must simply adopt these 4 P’s. As in, define your buyer personas (and, yes, for those of you wondering there’s a bet in the office to see how many posts in a row I can mention defining your buyer personas). 74% of people online get frustrated with a website when content appears that has nothing to do with their interests (source: Janrain). The days of a single message being broadcast to your entire market are over. Driven largely by the on-demand nature of online content, customers have become accustomed to personalize engagements, on their terms and preferred channels. I’ll spare the details here, as I’ve written much about buyer personas in other posts, but you cannot win the moment if you’re not completely clear about who you want to connect with, and where they are in their journey. We’ve been personalizing emails for years, the time has come to personalize your website as well. Content for the sake of content is never a good idea. That said, there is no longer any reason that your company can’t produce (lots of) quality content that resonates with your buyer personas. The average number of pieces of content reviewed by a customer before making any can of a decision doubled from 5.2 to 10.4 from 2010 to 2011 (source: Google & Shopper Science). Companies with 30+ landing pages generate 7 times more leads than those with 5 or fewer; and those with 40+ produce 12 times more leads (source: HubSpot). There are two aspects to participation. The first involves sharing and promoting your content, and the second involves nurturing. Winning the moment is not a Field of Dreams event, you can’t simply build it and wait for them to come. You must participate in the larger ecosystem. This means that you must structure and design your website to support this approach, utilize your email tools to point people in the direction of your content, and, yes, you must participate (actively) in social media. For those who feel that social media is a waste of time, consider, social media lead conversion rates are 13% higher than average conversion rates (source: HubSpot). Only 25% of the leads you generate are ready to buy, 75% need nurturing (source: Gleastner Research). Lead nurturing email have click-through rates that are 2.5x general emails (source: HubSpot). Leads who are nurtured with targeted content produce a 20% increase in sales opportunities (source: DemandGen). Companies that excel at lead nurturing generate 50% more sales-ready leads at a 33% lower cost.